A destination Virginia Wine tasting room in the heart of Virginia in downtown Farmville. "The landscape and climate of Virginia offers countless choice sites for vineyards. Each of the state’s main regions boast vineyards and wineries. Given Virginia’s varied grape-growing sites with ideal soil conditions, fine wines now come from all over the state. Spectacular landscapes, picturesque vineyards and fascinating people make up Virginia’s wine industry. WHICHEVER DIRECTION YOU TRAVEL, you’ll experience world-class wines, and the realization of a dream shared by many." 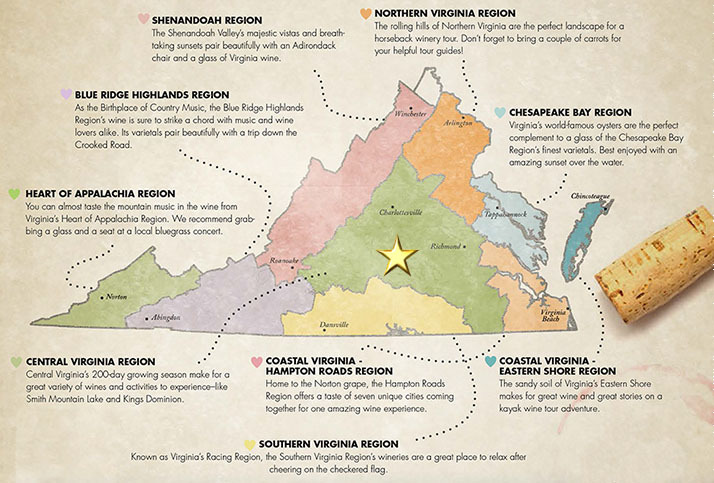 What if you wanted to experience more than just three or four Virginia Wineries in one day? What if you didn't want to have to choose a direction to travel? The idea for the Virginia Tasting Cellar was born from those questions. We are creating one beautiful, riverside tasting room, right in the middle of it all, where you can; sample, learn, drink and purchase wine from an ever-changing line up of wineries!